Use a paper hem gauge and an iron to mark where you want to sew your hem. Simply fold the fabric over the paper and iron so that it stays flat. Then, just sew! If you’re sewing a hem on a fabric that can be easily damaged (such as leather), use binder clips instead of pins or an iron to mark where to sew. Instead of straight pins, which can make your project bulky, use a few piece of scotch tape to hold your zipper in place while you sew it. If you have a zipper that’s too long for your fabric, make it shorter by sewing several stitches over the teeth to mimic the metal stopper at the bottom. Then, just cut the zipper. When you unzip it, it’ll stop at the stitches. When cutting your fabric, find the grain line and cut along it to keep your pattern symmetrical and to make for an easier way to attach two fabric pieces. Serge or zig-zag stitch the raw ends of your fabric to keep them from fraying. If you’re cutting burlap, pull one strand out and cut along the gap to cut the fabric in a straight line. 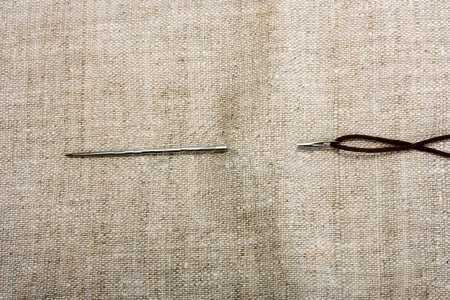 If you need to turn a small piece of fabric inside out, use a straw and a skewer. Simply put the straw into the fabric and push the skewer into the straw from the other side. Then, pull the straw out and push the skewer until it has turned the fabric inside out. When threading a needle, spray the end of the thread with hair spray to stiffen it and make it easier to put through the needle. Make a pin cushion and use steel wool to stuff it. You’ll keep your needles nice a sharp, since the wool sharpens them when you poke them into the cushion. Store your bobbins in pedicure toe separators. The toe openings are the perfect size for them! Instead of buying several spools of thread, invest in a cone to save money (and to thread your machine less often). If your cone doesn’t fit on the spool pin, place it in a coffee mug next to your sewing machine and drape the thread around the pin. If you’re using a delicate thread, use a second, sturdier thread to prevent it from breaking. Simply thread both threads through your needle. Use nuts, bolts, and washers as pattern weights so that your paper pattern doesn’t move. Attach a measuring tape to the edge of your sewing table so that you’ll always have a ruler to use. Keep a large magnet around so that you can collect any dropped pins or needles. This entry was posted in General Information and tagged hacks, sewing, thread.